more of a dedication to the music and the instruments." 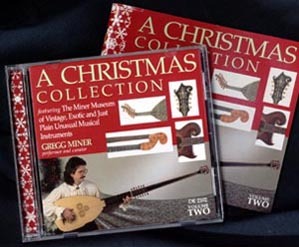 Click on your choice of CD cover above to obtain the song and instrument list. There are countless collectors and collections of musical instruments out there, but only the tiniest fraction of these ever come to light. Not only do the vast majority of these private collections remain unseen but, even to their owners, often remain unheard. I was one of these people until one day I had a revelation . . . I have to admit that the Miner Museum book and recording project (pictured above) was extremely cathartic for me personally. Like Everest needing to be climbed, these instruments - hanging by the dozens untouched on the walls - needed to be played. So, one by one, with what my friends called a pathological single-mindedness, I systematically took each instrument down, had it restored, researched it, re-strung it, and immersed myself in it until I felt I could produce valid music on it. Then I arranged and recorded as fast as I could and on to the next one. 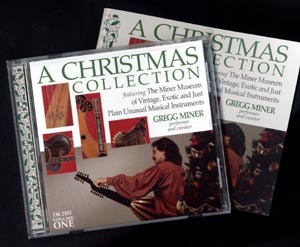 My choice of a Christmas theme proved ideal, as the tunes were not only already written, but served as wonderful, emotional inspiration to create real pieces of music, not just strange sonic experiments with the instruments. Ironically, with the array of instruments, the arrangements were somewhat experimental. If the sounds and arrangements are unusual and unique to the public, they were equally so to me! Ultimately, a hundred instruments from the collection made it onto the recordings, encompassing two volumes and 27 holiday arrangements. I had planned all along to include photographs of each instrument and my admittedly personal thoughts on them, and ended up with a 52-page booklet for each volume. All this only took five years! The only thing I hadn't prepared for was the warm response from not only musical instrument enthusiasts, but people of all interests. However, the most gratifying aspect of all was that, while I intended to happily share the collection with the public, they were touched more by the music. Thanks to all of you who have listened and enjoyed! The transcript of the INTERVIEW from my promotional video (rather incoherently ad-libbed at the time) may provide some additional background on the making of "A Christmas Collection."